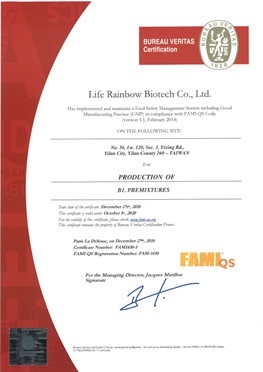 In this January Yixing factory of Life Rainbow Biotech has been awarded European Feed Additives and Pre-mixtures Quality System (FAMI-QS) certification. FAMI-QS is a standard based on European animal feed Regulation. The range covers from feed safety management systems, quality, product regulatory compliance to traceability. Since January 2018 this new factory started to operate, it has been adopting ISO 22000 Food safety management, ISO 14001 Environmental management and quality control conducted by Life Rainbow Biotech molecular nutrition laboratory certificated with ISO 17025. The receiving of FAMI-QS further demonstrates Yixing factory of Life Rainbow’s is capable of providing safe, qualified and reliable products to our esteemed customers and the global market.